Obviously Florence offers a lot to do during all seasons, as to visit its extraordinary museums. But we would like to suggest some wonderful itineraries, not always so well known by everyone who comes in Florence. In this page we signal two itineraries and we are at your disposal for information about others when you would like. A walking from Ponte Vecchio to the Forte di Belvedere's hill, reaching then S. Miniato church and finally Piazzale Michelangelo, from where you can come back to the B&B with bus n. 12 or bus n. 13. The Ponte Vecchio (Old Bridge) is one of extraordinary monuments in town. But very close to it, there is a not so visited, but very beautiful, zone: in a moment, you'll be in the countryside hills just outside Florence. "Costa de' Magnoli" begins here, under this narrow arch: "Volta de' Magnoli", opened in the Bargagli-Petrucci palace. From Ponte Vecchio (on the leftside River Arno) take on the left Via dei Bardi. After few steps enter under the arch, where Costa de' Magnoli begins. Continue on Costa San Giorgio. In this street, number 17, Galileo's house; the great scientist often received here the visit by Gran Duke Ferdinando II De' Medici, a strenuous supporter of the scientist. Between the street's wall, in the middle of ancient houses we suddenly see this side view: Palazzo Vecchio and the Cathedral's Dome. Galileo house; the scientist lived here, before moving to Arcetri's villa, few miles far. Few steps and we are at the slope's top, where there is "Porta San Giorgio", a middle-age door, ascribed at Andrea dell'Orcagna and part of the middle-age limit-mark. Happily, these ancient walls were not destroyed, as elsewhere in Florence. On the right there is the grand building of Forte di Belvedere, actually closed to public. Pitti Palace, Boboli Garden and Forte di Belvedere, top left on the hill. Lunette painted about 1599 by Giusto Utens. The Forte is characterized by the splendid small Palace ("Palazzina") just on the top, visible from all the city. All the fortification was built by Bernardo Buontalenti, exceptional artist; known also for his ice-creams. Actually, you'll find in Florence ice-cream shops a delicious cream that has his name. From Porta San Giorgio take S. Leonardo street. This street is very loved by florentines: quite completely limited by ancient walls (muretti a secco) and marked out in olive ground, crops and gardens; in fact we are yet outside the city, in the countryside, just 10 minutes far from Ponte Vecchio. Arrived on the way out on the Viale Galileo, take on the left. This Viale, this boulevard is a part of those that in past years was called "Stradone dei Colli" (Big street of hills) and now it is expeditiously called "Viale dei Colli" by florentines, even if it has different names depending on the way. Here the boulevard is named by Galileo and it's one of the most panoramic florentine way. After about 1 KM, 0.60 miles, take on the right Via delle Porte Sante towards San Miniato Basilica, one of most beautiful and ancient Florence church. The construction began in 1013 and the church is esteemed an absolute Romanesque art masterpiece. We don't speak too much about it, as information is found in every guide; we only say that beside the Basilica there is a little shop where we can find the excellent liqueurs and caramels made by Olivetani friars living there. San Miniato was an armenian or syrian christian, when he moved to Florence during the III century christians were still persecuted. San Miniato was condemned to be torn to pieces by the lions in Florence amphiteatre. The legend tells that in San Miniato presence, the lions became immediatly gentle, and others attempts to kill him didn't get more success. At last, the soldiers succeeded to decapitate him. But the saint took his head in his hands and went on the hill. When he was there, he lied down and finally he expired. From that time the hill became a venerated place by all christians and there the San Miniato Basilica was built. San Miniato was indeed the only Florentine saint for many and many years... and he was not even florentine... Florentines was instead the people that killed him! From San Miniato hill, the Piazzale Michelangelo is near, and you can return to our B&B by bus n. 12 or n. 13. A tour close to our BB, entirely on foot: very beatiful Florence's squares and corners, museums some of them very known, other lesser - but not less interesting - and some of the best coffes and restaurants in Florence. We start from our BB, 13 via Leonardo da Vinci. Just out the door turn right and you are immediately in Piazza Savonarola. The spectacular Nineteenth century square is one of the most successful and pleasant made during the century, with a scenic mix of big horse-chestnuts, cedars and stone pines. At the corner of the square with via Buonvicini, turn right on the same Via Buonvicini and after few meters you'll be at the crossroad with the avenue, in italian "viale"; cross the avenue, Florence historic center starts here: in fact the "viali", these avenues were built in the Nineteenth century, pulling down the medieval walls that had protected the city since centuries, as it can be seen in this drawing. Then, crossed the avenue, take straight Via Gino Capponi. Down the street, you can already see the dome profile. After a hundred meters, you'll find on the right the Palazzo di San Clemente, genially designed by mannerist architect Gherardo Silvani. Among others, the palace was owned by a famous couple, Charles Edward Stuart pretender to the throne of Great Britain, and Princess Louise of Stolberg-Gedern also known as Countess of Albany; indeed, it was inside this palace that the Princess met for the first time her great love, poet Vittorio Alfieri, in October 1777. San Clemente Palace is presently owned by Faculty of Architecture, University of Florence; but the palace is on sale, as reported by newspapers recently (news in italian). In a street on the right, via Micheli, at n. 3 there's the entrance of the Giardino dei Semplici, Florence's small, ancient botanical garden, established on 1545. Via Capponi ends with Piazza Santissima Annunziata; at n. 1 of the square there's the entrance to National Archeological Museum of Florence; not visited as Uffizi or Pitti but it's a pity because it contains wonderful artworks of enormous value in History of art, like the Chimera of Arezzo or the Arringatore, here in the photo. Piazza Santissima Annunziata it's probably the most beautiful Florence square: it's the most perfect model of Renaissance architecture, with the façade of Spedale degli Innocenti by Brunelleschi, started in 1419 which gave birth to the Renaissance itself as it was the first building designed with the "new" classical ideas as ideal reference. Inside the square also two twin bronze fountains by Pietro Tacca, masterpieces of Mannerist art; fountains' subject is the sea creatures, because they were originally intended for the city of Livorno but Grand Duke impressed by their beauty decided to retain them in Florence (Livorno has some copies). The Basilica della Santissima Annunziata is litterally full of art, by notable painters; but as it's an important Marian faith church too, it still nowadays attracts a lot of believers, unlike other florentine places of worship. So inside this church you will find many regular churchgoers praying. Keep count of this if you decide to visit this basilica, also because during some religious ceremonies visit is not allowed; apart from this the entrance is free and we suggest you to visit it. Inside, frescoes from Rosso Fiorentino, Andrea del Sarto, Pontormo among other artworks. From the square take Via dei Servi, which brings to the Dome. After some steps, on the left in Via dei Servi, there is Robiglio, one of the best florentine cake and coffee shop (caffé pasticceria), very known also for the hot chocolate. At the corner between Via dei Servi and via degli Alfani take the last on the right. Just around the corner, in Via degli Alfani at number 78 you'll find another small museum: Opificio delle Pietre Dure is now an art restoration office, but it was born in 1588 as a workshop of florentine precious stoneworks and some of these arts artifacts, like the table above, are displayed on the Opificio museum. This museum is open from monday to saturday, from 8.15 a.m. to 2.00 p.m., last entrance at 1.30 p.m.
Just few steps away there's Accademia Gallery which every year is usually one of the five italian most visited museums and this because of the presence of Michelangelo's David, even if Accademia has other paintings and sculptures, well deserving to be seen and appreciated. From Accademia Gallery, move to Piazza San Marco, just some steps away, where San Marco National Museum is on the contrary to Accademia, not so visited; but we usually suggest to our guest this secluded, not so known museum, which is a wonderful, ancient monastery, an architectural masterpiece itself, and with marvellous paintings; among them the world biggest collection of Frà Beato Angelico artworks. The monk painter lived inside this monastery for long years and he painted here some of his masterpieces. From Piazza San Marco take Via degli Arazzieri; near the next crossing, in Via XXVII Aprile at number 1, you'll find the entrance to Cenacolo di Santa Apollonia, a Last Supper fresco, the masterpiece by Andrea del Castagno. Loggia dei Tessitori has columns made with pietra serena, a local sandstone. This grey sandstone was widely used in Tuscany and especially in Florence since ages; in Florence a numberless of buildings, and every sort of architectural elements are made of it. Florence artists loved this stone, for its color and characteristics; this stone undergoes weathering, so its surface tried by rain and wind, gives Florence architectures, streets and places, a special appearance. It's the case of the little sculpture of the pilgrim above; or of this Loggia dei Tessitori, with the four central columns heavily damaged and recently replaced by new ones. At number 74 in via San Gallo, there's Pandolfini palace. The building is a project of Raphael, for the Pandolfini family, which is still today the owner. The palace has a style between the palaces of Rome and Florence, with its proportional, classical measures, but at the same time also more magnificent than the essential and synthetic florentines palaces. Porta San Gallo and Piazza della Libertà are not so far; here the city in ancient times had its walls. Now, as seen before, you'll have the Viali, the Boulevards; at the center of some squares, there are still some of the ancient big doors, which were built during middle ages, by architect Arnolfo da Cambio. Here in Piazza della Libertà you'll see Porta San Gallo, one of the most imposing ones. San Marco Museum is a magic place, also because of the architectural design: here, the Library, sublime outcome of Renaissance art, with its pure, mystical yet very humanistic proportions. Near to Piazza San Marco, in Via Cavour at number 69 you'll find the Cloister of the Scalzo; it's one of the 31 halls, cloisters, art spaces, villas with free entrance in Florence. Cloister of the Scalzo is a tiny place, with the wonderful monochromatic frescoes by Andrea del Sarto; information on opening hours on the page of Florence Museums opening times. Take Via San Gallo direction Piazza della Libertà; it's a very ancient street, as it's the prolongation of roman city of Florentia's cardo, just outside the roman walls. Till 19th century when Via Cavour was opened, Via San Gallo was the most important street in the area, that's why it's full of palaces and ancient buildings. As it was the street used to arrive to the city, and to leave it, directing to North, it was full of hospitals for pilgrims and voyagers. Some traces are still nowadays be seen, as this ancient stone, indicating an accommodation for pilgrims, near number 32. Nearby 32, Via San Gallo there's the Loggia dei Tessitori; i tessitori, Florence weavers had their base here. 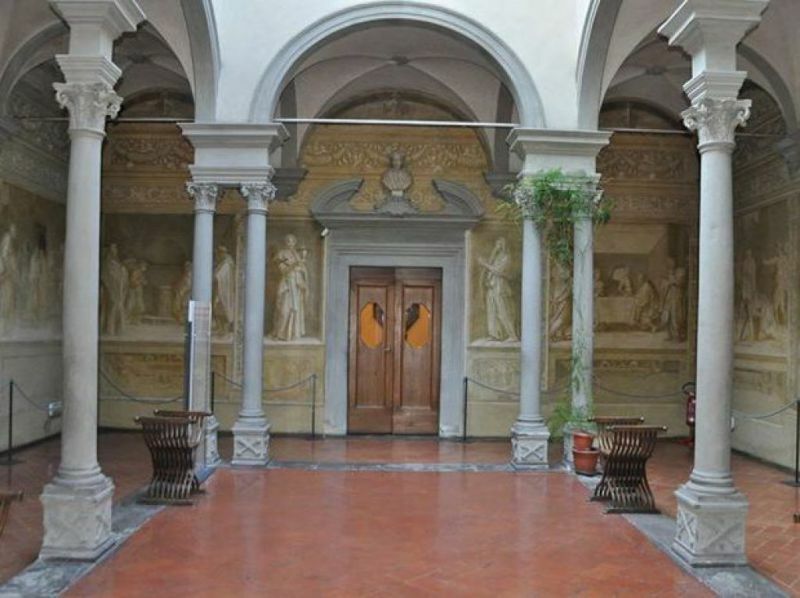 The beautiful loggia was designed probably by Giuliano da Sangallo, during 16th century. A new column of Loggia dei Tessitori: it's possible to see the presence inside the pietra serena sandstone of mica flakes, one of the reason that made this stone loved by tuscan artists. Few meters far you'll find at a crossroad with Via delle Ruote a tabernacle; this is made by Andrea di Bonaiuto, a fourteenth century painter, which is known for its liveliness and ability to return scenes of daily life, as in his masterpiece, the Cappellone degli Spagnoli, a big fresco now inside the Santa Maria Novella museum. From Piazza della Libertà you have just some steps to do to arrive to via Leonardo da Vinci and our bed and breakfast.